Chartered by the Grand Lodge of North Carolina A.F. & A.M.
Making Good Men Better since 1788. Welcome to the web site of Phoenix Lodge No. 8 of the 17th Masonic District, under the authority of The Grand Lodge of Ancient Free & Accepted Masons in North Carolina—the oldest Masonic lodge in Fayetteville, North Carolina. Believed to have been established as Union Lodge around 1760, it was renamed Phoenix Lodge on 17 November 1788. Always active and influential, our lodge was among a group of nine early lodges that called for the formation of a Grand Lodge in North Carolina. Despite wars, fires, and other tribulations, Phoenix Lodge No. 8 has never gone inactive since its founding in 1788. 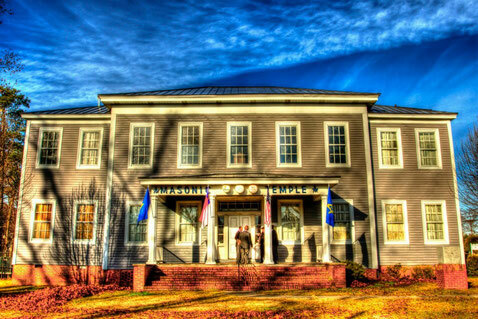 As such, it is one of the oldest continuously operating lodges in the state of North Carolina. Today's members are leaders in the community who uphold Phoenix Lodge No. 8's proud history while honoring our Lodge's progressive traditions. All good men and Brothers are welcome here, regardless of race, creed, or religion, and we hope you will visit often. If you seek true friendship, you will find it here. Looking for a Lodge with history, character, and tradition? Phoenix Lodge counts among its members a Vice President of the United States, two members of the United States Senate, three U.S. Congressmen, an Ambassador, a Consul, two Federal Judges, two Generals, a Governor of the State of North Carolina, 8 members of the North Carolina State Senate, 31 members of the North Carolina State House of Commons, State Supreme Court Justices, and a signatory to the United States Constitution. Sixteen Grand Masters of the Grand Lodge of North Carolina A.F. & A.M. have been members of Phoenix Lodge No. 8, as have many of the leaders of Masonic organizations at the state and national level. Nine of our members have been awarded the Joseph Montfort Medal, the highest individual honor awarded by the Grand Lodge of North Carolina A.F.& A.M.
To read more about the kind of men who have been members of Phoenix Lodge No. 8, click here. You will be known by the company you keep. Choose well. Stay Current with our Facebook Feed!